Phat J talks continues to cover his latest obsession Warzone Resurrection! This week he covers the American mega corporation, Capitol! How could I start the Warzone Resurrection faction overviews without starting with the most bombastic, larger than life corporation of them all, the American themed Capitol? 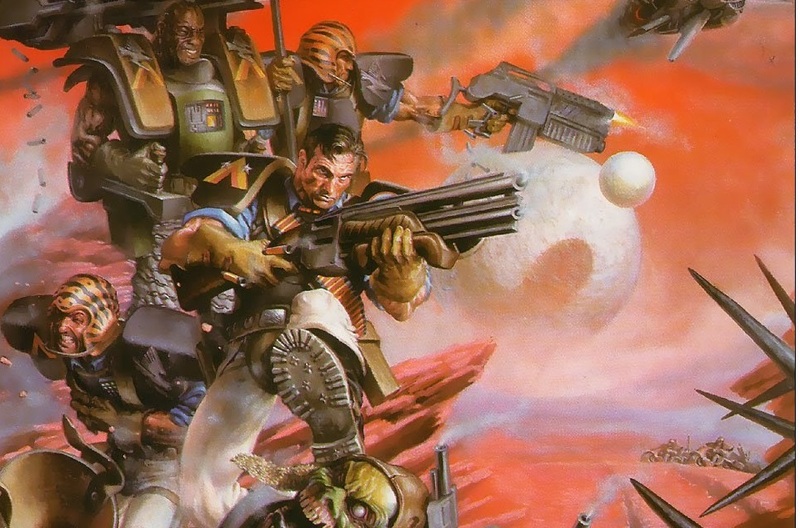 No other mega corporation can boast the number of specialized units and the faction is known for having several larger than life characters such as the mini gun toting Big Bob Watts and the iconic Doom Trooper Mitch Hunter. For players looking for a faction that talks the talk and has the serious firepower to back up their walk this is the army for you! Let’s take a quick look at Capitol’s history in the Warzone Resurrection universe. Capitol emerged as the preeminent corporate power in the western hemisphere on old Earth during the time the planet’s resources began to dwindle. Primarily made up of the United States the faction has several Latin American themes as well. Like the capitalist society that came before it, the Capitol corporation is run like a free market economy, and each citizen of Capitol holds stock in the corporation and can cast votes for the leadership. Capitol was one of the first corporations on old Earth to recognize the old way of life was ending and spent massive amounts of money to colonize the moon and build permanent fueling stations there, so when the rest of the mega corporations began to follow suit the Capitol corporation monopolized the transit throughout the solar system, making the corporation incredibly wealthy in the process. Soon after the colonization and terraforming of the inner planets began, Capitol colonized much of Mars and built their capitol city San Dorado. Capitol has the largest military of any of the other mega corporations and standard policy is to respond to any military provocation with overwhelming force, so all out warfare between them and other corporations is relatively rare. Most of their military is made up of specialized units with various Light and Heavy infantry elements used to hold territories taken in engagements. While the other mega corporations might be smart enough not to start any large scale conflicts with Capitol, the Dark Legion has no qualms and poses a serious threat to the corporation and their way of life. It is only due to Capitol’s continuous fight against the daemonic enemy that the entire human race has yet to be exterminated by the dark threat. With the highest casualty rate in the entire Capitol Armed Forces, you’d think these guys would have a hard time recruiting but the Airborne Cavalry never have a hard time finding maniacs who want to jump out of perfectly good airplanes. Made up of criminals, deserters, and other scum from different Capitol Armed Forces that have been disgraced in some way the Free Marines offer these degenerates one last way to earn back their citizenship. Modeled after the daemons that keep the poor Mishiman (Japanese Corporation) awake at night, these madmen wear specially modified jump packs that wail and scream as they tear into their enemies. They specialize in rapid insertion strikes. Umm, HELLO. Guys riding vintage looking metallic rocket bikes! How cool are they? The purple sharks zip over the battlefield either dropping bombs or firing their light machine guns into enemy positions. 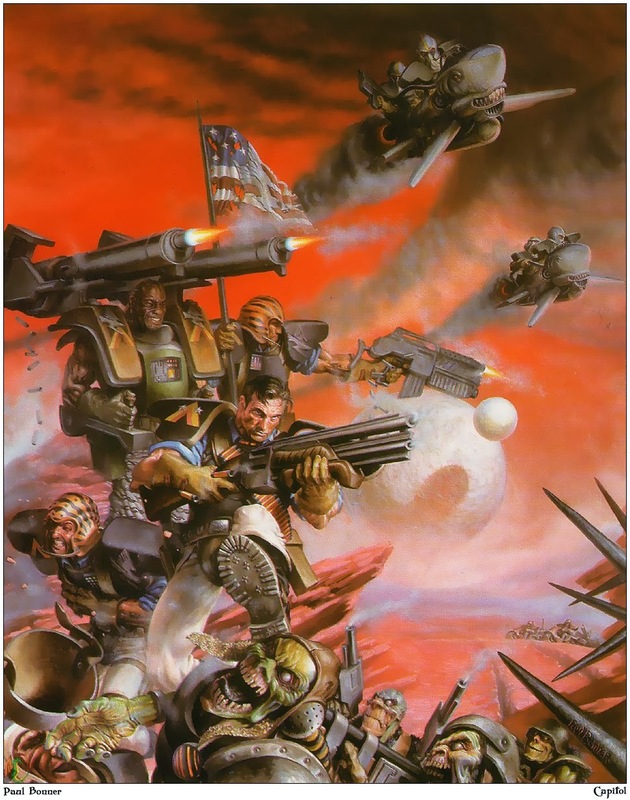 The Capitol faction must be taken in different Battalions, each one giving the player different unit options and buffing the units that are taken, i.e you can have an Assault Battalion or Line Battalion, etc. Each Battalion option also opens up Enhanced Tactics options that can be given as squad upgrades that will significantly boost a squads efficiency towards the Battalion’s specialty. Capitol players should treat their army like a scalpel, with each unit brought for a specific task and then used to take apart the enemy piece by piece. The army is not a sledge-hammer and should not be treated as such. Luckily, there are so many specialized unit in the faction, and the Battalion bonuses really let you kit them out even further so you shouldn’t have a problem having tools to deal with any threats you face on the Warzone battlefield. For those that are interested, Prodos recently released their first errata for the V2.0 of their rulebook, which can be downloaded in it’s entirety here. As usual, if this is something you are interested and you would like to purchase the models cheap, we have them for sale in our ebay store. Check it out for some big saving today! Get these three GW box games for $300, plus shipping.